Pedestal Showcases are excellent for promoting special merchandise in open store areas. 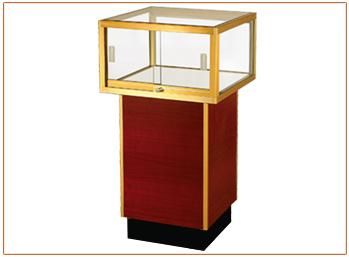 Display pedestals are perfect for highlighted merchandise and other jewelry or valuable items. The overall height of a square pedestal showcase is 38” high. Display area is 12” high and is available in 3 widths. The wood pedestals are 22” high with a 4” high black kick base. The pedestals on a standard case are closed; storage options are available. The display area is accessible through sliding glass doors; 30” and 36” cases have two sets of doors on opposite sides so the insides are easily reachable.